Yesterday was one of those days that stay in my mind for quite some time. Yesterday I met with 32 families who are in their first and second savings cycles. What made the visit so memorable was the act of stepping back to those difficult years when we began Tabitha. Getting to the project area was a test in patience – unlike before – traffic has increased a hundred fold and just getting out of the city is a test of its own. 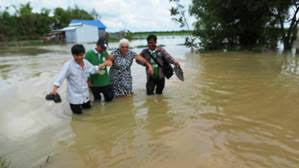 Travelling to the community we bounced down a bumpy path until we were confronted by a flood of water. No motorbikes, no cars could enter – just taking off our shoes and walking through thigh high water, stubbing our toes on hidden rocks, sliding uncontrollably in glutinous mud.